As you’re getting ready to join us at Circle RV Resort, you might have a question or two. Below, we’ve answered some of the most common questions about the resort. Still have a question? Feel free to call us or use our contact form, and we’ll be more than happy to help. Do you offer Wi-Fi? Is it free? Yes, we offer free Wi-Fi at the resort. This is a standard connection perfect for checking emails or light surfing of the web. Our rates are based on length of stay, the size of the space, amenities of each site, and location within the resort. View our rates page here. Make a reservation online or phone toll-free at: 616-202-2063. Each of our RV resort spaces features water, sewer, cable TV, and 30/50 amp electric. Monthly stay rates are plus metered electric. Do you have pull-through spaces? Can you accommodate a 45-foot RV? Yes and yes. Circle RV Resort features a limited number of popular pull-through sites. Due to their high demand, we do not offer these sites for extended stay reservations. We do, however, have many large sites that we can offer our extended stay visitors and owners of the larger RVs. Are you close to San Diego attractions? Circle RV Resort is located in East County San Diego County. Located off of Interstate 8, it is an easy 20-25 minute drive to many top attractions, beaches, and downtown San Diego. Be sure to visit our San Diego Attraction page found here for more information on what there is to see and do when you stay at the resort. Absolutely. There are several local restaurants within two minutes of the resort. Grocery stores and major retailers, like Walmart, are only 10 minutes away. If you are looking for more shopping options visit our front office for a map of local spots to visit. Do you allow RV groups? Circle RV Resort can accommodate groups of five to 20 RVs. Scaled contracts are based on the number of RVs reserved. We offer a club room, kitchen and other great amenities to serve your group. Please call our front desk to set up your group reservation, call 800-422-1835. Do you accept pets? Are there any restrictions? 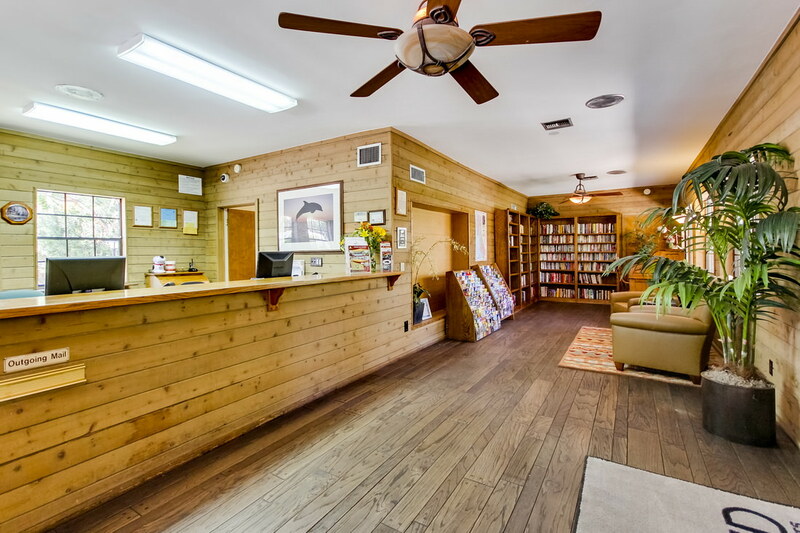 Every Sunland RV Resort is pet-friendly. We supply pet waste bags and have several nice walking areas for your pet’s enjoyment. We do limit each site to two pets and do not allow any aggressive breeds. For specific restrictions, contact us at 800-422-1835. Do you have a pool and is it heated? We sure do, our resort offers both a temperature-controlled outdoor pool and a spa for your year-round enjoyment. The enclosed pool area features privacy landscaping, shade umbrellas, and lounges. Yes, we do. Propane can be delivered directly to your RV and is also available at our resort’s propane station. Do you have restrictions on RV types? Yes. All RVs must be fully self-contained and are subject to an exterior inspection upon arrival. Your RV must be clean and rust free with no broken windows. Motorized RVs must be in running, working condition. Tarps on roofs and other modifications are strictly prohibited. The resort has a complete list of rules and regulations available for your review. Tent camping is prohibited at Circle RV Resort. Unfortunately, no. Local city ordinance does not allow this for your safety with RVs and propane gas in the vicinity. However, barbecues are welcome. No. We are non-membership and non-ownership RV resort. We offer daily, weekly, and extended stay rates. We have a 6-month extended stay limit. Please inquire with the front desk for seasonal stays. We offer 10% discounts off of our daily rate for; Good Sam, and Active duty military. We also offer Passport America rates for a three-day maximum when available. A valid ID card must be presented at check-in to obtain these discounts. Offers may not be combined and do not apply to any other discounted rates. If you are looking to book a certain site then please call our front desk staff to assist you. We can not guarantee availability. Yes, we have spotless on-site laundry facilities for your convenience. Do you offer RV storage on site? We have a very limited number of storage spaces available, but additional RV Storage can be found at our nearby sister resort. Westbound I-8: Take exit #20A for Greenfield Dr. Go right, through the signal (Pepper Dr.), and the resort entrance will be to your right. To view our resort on Google Maps click here. Do you offer RV Rentals? Daily/Weekly Reservations: Notify the resort of changes/cancellations within 24 hours of arrival or a one-night minimum charge will be billed. This is no fee for reservation changes and cancellations made before the 24-hour window. Holiday Reservations: Notify the resort of changes/cancellations within 72 hours of arrival or a three-night minimum charge will be billed. This is no fee for reservation changes and cancellations made before the 72-hour window. Monthly Reservations: Notify the resort of changes/cancellations within 10 days of arrival or your security deposit will be forfeited. This is no fee for reservation changes and cancellations made before the 10-day window.